Our aim is to improve the levels of education and academic research conducted at member universities and junior colleges, while strengthening cooperation and collaboration between them. We strive to extend support for students, to enhance their growth; we also strive to expand international cooperation and exchange, so as to promote the internationalization of universities and colleges. In addition, we aim to develop higher education, mainly in Kyoto, and to foster human resources who can play leading roles in the international community, while encouraging cooperation with local communities, government and industry and promoting regional development and revitalization. To those ends, we will provide education, support for students and training; conduct research and studies; collect and dispatch information; and encourage social interaction to contribute to the development of higher education in Japan. 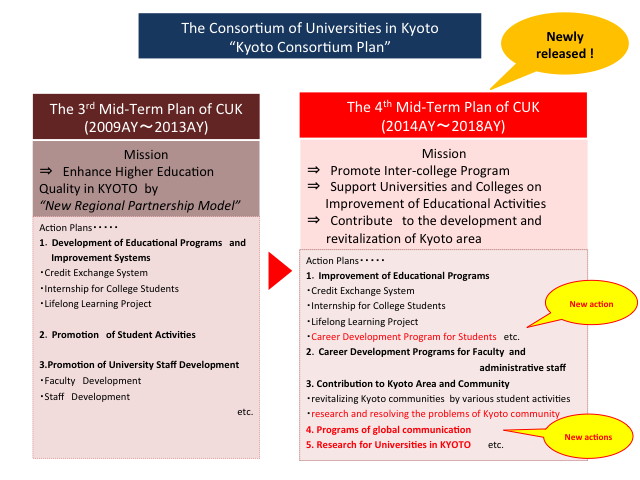 The Consortium of Universities in Kyoto initiated. ※　Please,click on an icon. This system enables students to take courses that are offered at other universities. To make students　inquisitive and more aware of a wide range of knowledge, a variety of subjects are provided so that students can take courses in individual fields such as humanities, society and nature, according to their interest. Since 1997, in cooperation with Kyoto City, this project has been responding to the needs of working people who continue to study. Under the project, people can take various informal programs as well as regular courses offered by universities and junior colleges. High school/university collaborative educational program introduces manabi (learning) at universities in Kyoto to high school students, their guardians and high school teachers, through simulated lectures and hands-on courses that offered by member universities and colleges. The forum helps participating students find academic fields that arouse their interest, improve their motivation for learning and clarify their objectives in the higher education, thereby giving them the best opportunity to consider their future career design. The objective of this program is to jointly develop regular course programs so as to achieve the learning goal established at high schools, based on collaboration between high school teachers and university faculty members, and to implement the programs throughout the year. Initiated the program in 2012, with the aim of enhancing the learning motivation of high school students through educational intervention and often informal setting. In collaboration and connection with high schools and universities, Conducting the forum in order to share information on domestic trends, and contributing information on efforts in educational issues. One of the pioneers in developing this kind project in 1998, not aimed to help students find jobs, this is an educational program aiming at fostering student motivation for learning by integrating real experience and educational research, promoting their vocational consciousness and developing independent and ingenious human resources. Faculty Development became mandatory for all universities since 2008, is a collection of organizational efforts to make academies to improve their course content and teaching method. Since 1995, shortly after the establishment, several support activities, such as training and forums have been provided to member universities. Targeting administration staff and technical support staff at universities and colleges, Conducting joint training programs and forums to enhance staff qualifications, including management and administration skills, as well as education and research support capacities. Through agreements with the consortium in the Fenway area of Boston, the U.S., and the university cooperation body in the State of Victoria, Australia, promoting the project with the aim of creating an environment that ensures access by all university students and faculty members to international interaction. In doing so, seeking to increase the international competitiveness of higher education and to assure and improve the quality of education in Kyoto. This is a system by which member universities of the Kyoto International Students Housing Support Organization provide support to international students in cooperation with entities that approve of the aim of this system. Supporting international students in securing residence in Kyoto without joint and several guarantors. By integrating the power of students in Kyoto, transcending the university framework, and introducing Kyoto—home to students—to society based on collaboration with government, business, universities and local communities, aiming to revitalize Kyoto and create its new attractiveness. In addition to the main festival held at Heian Shrine and Okazaki Park in October, conduct ongoing activities, such as local exchange activities. Japan’s largest international student film festival, this is planned and organized predominantly by students. Aiming to create opportunities for international exchanges and mutual understanding, and to activate Kyoto by discovering abilities, which can add a new area to the film, from various international film works full of many possibilities, and introducing these abilities through the works. Providing policy studie students opportunities to make presentations and exchange research results between other students as well as academics, with the aim of disseminating, on reflecting their research results in actual policies. Nominate projects in which universities and local communities make concerted efforts to create attractive local communities and resolve community issues; grants are offered to awarded projects. Aim to return knowledge gained through research at universities to local communities and society by reflecting university researchers’ creative and academic research results in policies and projects of Kyoto City. Office for All Japan Universities Consortium, for which we serve as secretariat, is an organization consisting of consortiums of universities in various areas in the country. With the aim of contributing to the development of higher education in Japan, providing support for the efforts of individual consortiums of universities and offering a platform for exchange their research results and other matters. Commend and offer a scholarship to students who serve as models for other students in terms of both character and academic work, who meet tuition and living expenses by part-time work and scholarships, with little money from their families, or who make remarkable contributions via social activities in Kyoto. Copyright © The Consortium of Universities in Kyoto All Rights Reserved.